Body butters are solid or semi-solid in their consistency ingredients. They are produced via extraction of various parts of the plants: seeds, trees and roots. Body butters have been used for centuries, all over the world, due to their nourishing properties. They are widely used in cosmetic products, as well as in culinary. Body butters are extracted from various parts of the plants, usually by crushing and boiling the parts in water. The extracted body butters then rise to the surface, where they are scooped and left to cool off. No chemicals may be added to the body butters (in order to remain natural). They are best when they remain raw, unrefined. 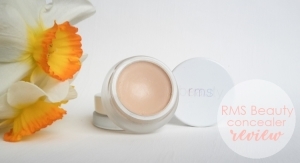 There’s hardly any natural organic product which does not contain at least one body butter as an ingredient. Body butters are widely used on their own or mixed with other body butters, carrier oils/vegetable oils and essential oils. They are used in various natural organic skin care products (moisturizer, lip balm), body care (body wash, body lotion, body cream, hand cream) and hair care natural organic products (conditioner, shampoo, hair mask, etc…). Body butters are praised for their numerous nourishing and healing properties. They contain nutrient elements, such as fatty acids (linolenic acid, linoleic acid, stearic acid, palmitic acid and oleic acid). They also contain antioxidants, such as vitamin E. They have moisturizing and calming properties. Body butters are great for dry, mature and undernourished skin. They have great anti-aging properties. They promote skin elasticity, are great for treating various skin conditions such as dermatitis and eczema. Body butters are used as hair treatments, and are widely used in body care: body cream, body lotion, foot cream, hand cream. Due to their gentle, yet nourishing properties, they are used in variety of baby products. Shea butter is, by far, the most used body butter. 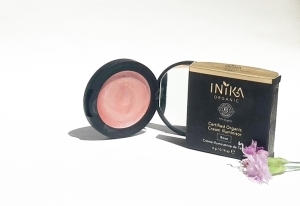 Used on its own or mixed with variety of other cosmetic ingredients, such as essential oils and carrier/vegetable oils, shea butter can be found in moisturizers, lip balms, body lotions, hair conditioners. Coconut butter/oil is also very popular in natural organic cosmetic products, as well as in culinary. 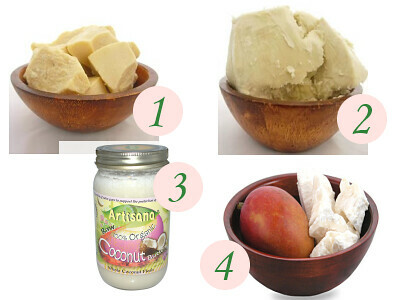 Cocoa butter and mango butter are used in lip balms and body lotions. 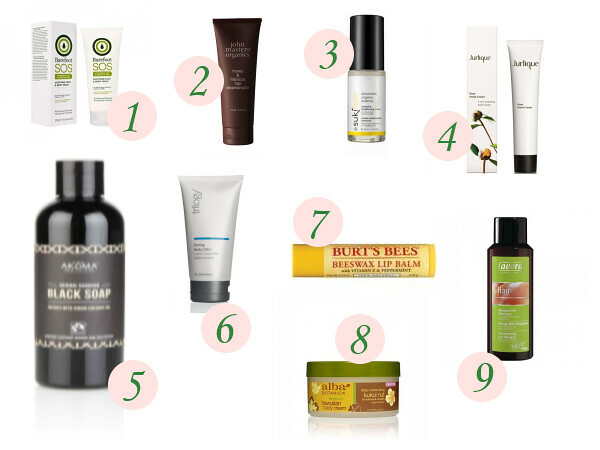 Most body butters can be used for any skin type. 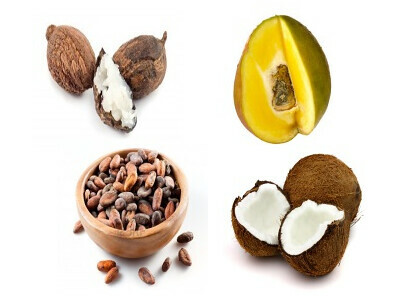 However, when used as a product for face, they should be in less concentration and mixed with other ingredients, such as carrier oils/vegetable oils, due to the fact when not used on the body, some body butters can prove to be comedogenic (for example: coconut butter/oil), and not suitable for oily and acne prone skin. For more information on body butters and many other ingredients, please read our extensive ingredients list. Where to buy body butters?